Well done on a great app! In reference to Jason and Liz’s comments, I remember having a great shopping app on my old Palm called HandyShopper. 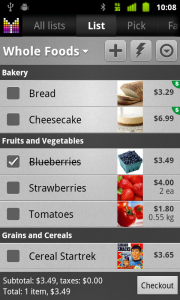 It allowed you to enter the price of each item for each store and would then highlight the fact that you could get this item cheaper at a different store if output it on the “wrong” shopping list. 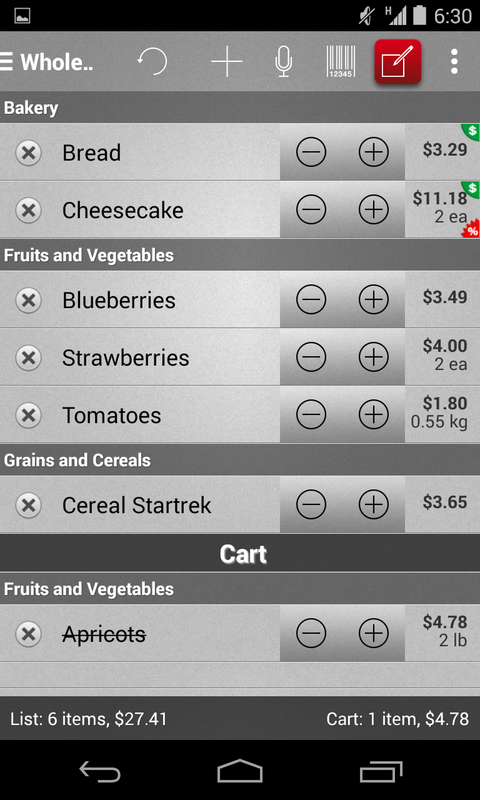 It was a great way of keeping track of what each item “should” cost. Hi Russell, thank you so much for your feedback and clarifying the feature details. 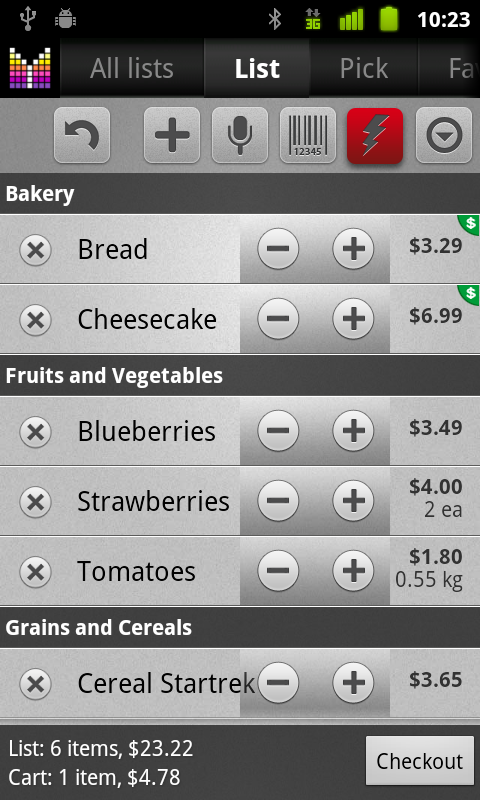 I have just updated our plans page and moved Store and compare product price feature up. Hopefully it won’t take too long for this feature to become available in our app. Thanks again and I look forward to hearing from you again. I have one minor problem that I can’t figure out. When I started using MG, the home screen showed a link to ‘Favourites’. Now it’s replaced this with a link to ‘Pick’, which I can’t change back. Any ideas? Sorry – I just rtfm! I must have ‘flung’ Favourites away. I’ve got it back now. No problem, Russell. I am glad you could find the solution. Thank you for an awesome app. Would love a place to mark that an item has a coupon. Also, just as a side note, upon purchasing the full version, I uninstalled the lite version. In order to continue with the uninstall, I had to choose a reason for install and there wasn’t an option for “purchased full version.” Just a suggestion. Hi Lynn, thank you for your feedback and supporting the coupon feature. Kindly note that we have Coupon Indicator feature on our short-term plans. Hopefully, it will be available soon. As to the reason of uninstall, I am totally with you on this one. However this sounds more like an improvement of Android Market app which in fact manages other app (like Mighty Grocery) installations on most of Android phones. Let me thank you again and I look forward to hearing from you again. Hi Janetta, thank you for your feedback and supporting the coupon feature. Kindly note that we have Coupon Indicator feature on our short-term plans. 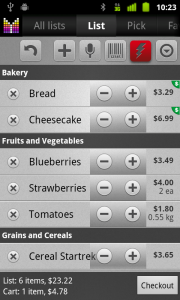 Besides an indicator there is going to be a way to adjust item price with the coupon. So hopefully the feature will cover your needs. Harold, thank you so much for your feedback. As to your #1, please try “Move cart items down” setting which would move items below the “Cart” heading in the list. As to changing background colors, this is going to be available in Themes feature which is a part of our plans. Looking forward to your further comments and suggestions. Could a future release include a sanity check for the check out function? I find I keep hitting the button by accident. Hi Liz, thank you for your feedback and suggestion. I’ve just added “Checkout confirmation” feature to our plans page. Hopefully, the feature will be delivered soon. Alysia, most likely the Add button has moved to the Sidebar after it was long-clicked. To get it back, open the Sidebar by clicking the rightmost button on the Toolbar and then long-click the Add button to get it back on the Toolbar. Also, you may want to have a look at recently updated section “Toolbar & Sidebar” on this page (it was added to address your question). Let me just say I LOVE THIS APP! Thank you! Thank you! Thank you, Amy. Pleasure to hear you like our shopping list. Sorry for the misspelled words and thank you for pointing this out. Will get it fixed in next release. Hi, Jason. Thank you for the questions. Unfortunately, there is no way to change currency at the moment, but we will be adding this feature soon. As to product prices, could you please elaborate on how exactly you would like to store product prices? You can change item price like this. But I suspect you are asking about a different feature. It would be helpful to have the last price entered to be attached to the item when next it’s picked. We still need to be able to update the price, but for budgeting it would be helpful to have a starting point. Liz, are you suggesting to track history of item price changes or just to save the latest price for later use? Kindly notice that there are some improvements with saving the latest price in Pick list. This has been introduced in latest Beta 8 update. 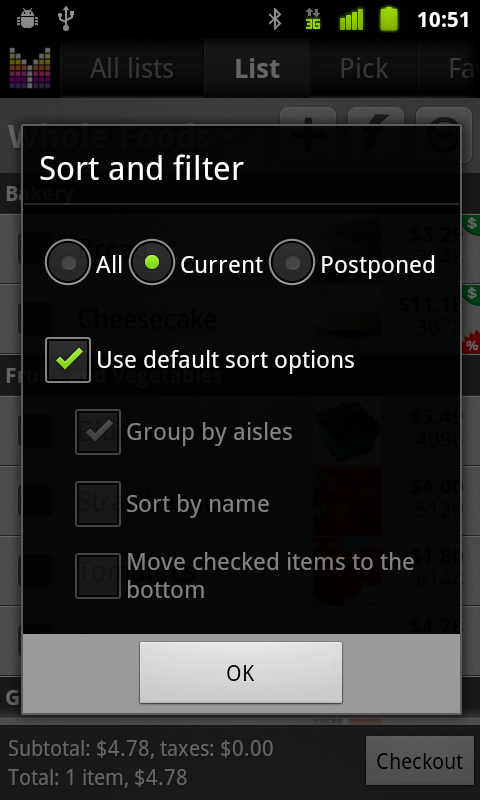 Kym, aisle customization will be available in the next release which we plan for the week of Oct, 4. It will be possible to reorder aisles, rename standard aisles, add custom aisles, hide aisles items for selected lists in search.